Guerrillas detonated a massive bomb in a Shiite market in north Baghdad on Tuesday, killing 51 and injuring 75. The bomb levelled a two-story building and set ablaze 20 shops. McClatchy says that US military sources suspect a rogue Shiite group of being responsible for the bombing, speculating that the blast may have gone off prematurely and that it had been intended for use against US troops. The evidence given– a secret Shiite claim of responsibility and the type of explosive– doesn’t seem to me conclusive, and I don’t actually think one can rule out Sunni Salafi Jihadis as the perpetrators. I fear that the Pentagon has lied so much in the past, attributing everything bad in Iraq to “al-Qaeda”, that their current campaign to blame everything on Shiite extremists linked to Iran seems suspect. In fact, Hurriya where the bomb went off used to be a mixed neighborhood that is now largely Shiite, and a Sunni revenge bombing in reprisal for the ethnic cleansing that drove Sunnis out seems to me a plausible motive. Guerrillas deployed a roadside bomb to kill a US soldier south of the Shiite city of Hilla. McClatchy also reports on efforts in the Iraqi parliament to curb the activities of the Mojahedeen-e Khalq (MEK or Holy Warriors for the People), which has 4,000 fighters at Camp Ashraf in Diyala Province. Iran considers the MEK a terrorist organization. It is rumored that the US Pentagon deploys the MEK to spy on and conduct covert operations against Iran, despite the State Department’s having designated it a terrorist organization. Shiite and Kurdish MPs in Parliament have now banned dealings with it and demand that Iraqi troops be permitted to guard the camp entrances. Turkey claims to have killed the bulk of 21 members of a guerrilla cell in Iraq of the Kurdish Workers Party that had been moving toward the Turkish border. PKK guerrillas have killed dozens of Turkish troops and civilians in the past year. The law revising treatment of former Baathists, which Bush and McCain had hailed as meeting a “benchmark” for political progress in Iraq, has never been implemented. The law is so ambiguous that how it is put into effect would determine if it could actually reduce the resentments of Sunni ex-Baathists. It was denounced when it was passed this winter by ex-Baathists such as Iyad Allawi and Salih Mutlak in the Iraqi parliament, which I thought a bad sign. Although this important Reuters story is itself a refutation of the whole Kagan-Bush-McCain victory narrative of the “surge” or troop escalation, it will not even be mentioned on American television. The troop escalation had been intended to lead to political reconciliation, not just to temporarily tamp down violence in some neighborhoods. In fact, it led to a massive ethnic cleansing of Baghdad’s Sunnis. There is no evidence that most of the Sunni Awakening Councils, who take money from the US to fight the Salafi Jihadis, are eager to reconcile with al-Maliki’s government, by the way. Patrick Cockburn reports that the US side has backed down on the issue of extraterritoriality for American security contractors in Iraq. Initially Washington, in its negotiations with the al-Maliki government for a Status of Forces Agreement, had demanded that private security guards such as those of Blackwater be immune from prosecution in Iraqi courts. This demand was unacceptable to the Iraqi side and almost led to a complete breakdown of the negotiations, but Foreign Minister Hoshyar Zebari (from the Kurdistan Alliance) insists that the talks are ongoing and will succeed. Of all Iraqis, the Kurds most want the SOFA; it is viewed with suspicion by most Arab Iraqis. Grand Ayatollah Ali Sistani has insisted that the text be voted on by parliament, and al-Maliki has acquiesced. Sayyid Muqtada al-Sadr says that it must be subject to a national referendum, for which there appear in fact to be no plans; the US is said to vehemently reject this idea. A controversy is raging in the Arabic press over whether the 4 Grand Ayatollahs in Najaf will present their own electoral lists in the provincial elections scheduled for this fall. Three of Grand Ayatollah Ali Sistani’s deputies, in Basra, Karbala and Kut, ran on the United Iraqi Alliance list in January, 2005, apparently because the resulting interim parliament was charged with drafting the Iraqi constitution and Sistani wanted his own men there. The three did not run again in December, 2005. One of them, Ali Safi of Basra, is now apparently saying that an “Ayatollahs’ list” may run in the provincial elections. This allegation has been denied by Sistani’s own office. If such lists were fielded, they would be serious competition for the Islamic Supreme Council of Iraq, which has run as part of the United Iraqi Alliance and used Sistani’s picture and endorsement to enhance its appeal to voters. Many Iraqis are disappointed with ISCI’s performance in office, especially with regard to the provision of services. Half the world’s growing refugee population is displaced from Afghanistan and Iraq. There are an estimated 2 million displaced Iraqis abroad, primarily in Jordan and Syria, with about 50,000 each in Lebanon and Egypt. There are an additional 2 million internally displaced. The Iraqis abroad for the most part decline to come back and UNHCR polling among them suggests they don’t intend to any time soon. This datum suggests that they don’t believe Iraq is stable enough to permit their return. If the hundreds of thousands of Sunnis displaced from Baghdad in the past 18 months did come back from Syria en masse, I suspect it would revive the civil war in the capital, because the Mahdi Army now occupies their homes. The Iraqi Parliament is hoping to move out of the heavily fortified Green Zone in September, on the grounds that violence has dropped so much in the capital that it is safe to do so. – Around 9 a.m. a man riding a motorcycle rigged with a bomb targeted a local awakening council, a U.S. backed Sunni militia, in Sleikh neighborhood killing four members of the militia and injuring two civilians. – Around 10 a.m. a roadside bomb exploded beneath Al Ghadeer bridge. The blast targeted Iraqi national police vehicle injuring one policeman and three civilians. – Around 4 p.m. A roadside bomb targeted civilians in Zafaraniyah neighborhood injuring one civilian. – Around 5 p.m. gunmen attacked two employees of the prime minister’s office in Al Nisour square killing one and injuring one in their car. 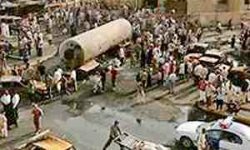 – Around 6 p.m. a parked mini-bus rigged with explosives ripped through a busy market in the northwest Baghdad neighborhood of Hurriyah, killing 51 and injuring 75. – Police found three dead bodies throughout Baghdad, one in Palestine Street, one in Haifa Street and one in Atifiyah. – Around noon a parked car bomb targeted a police checkpoint near the Diyala police headquarters in central Baquba injuring 4 policemen and 14 civilians. – Gunmen killed Muhyee Al Deen Abdul Hameed, a newscaster at a local station called Nineveh Television, in Al Ziraa neighborhood in northern Mosul. The gunmen fled after they shot Abdul Hameed.